Opposing the Indo-US civilian nuclear deal, former US President Jimmy Carter has said it has sent "uncertain" signals to countries like Iran and North Korea and will open a pandora's box of nuclear proliferation. Minute moons just a hundred metres or so across orbit Saturn within its rings, astronomers reported today, suggesting that the finding would shed light on how the planet's majestic ring system came into being. Day turned into night throwing birds and animals into a tizzy as the moon blotted out the sun during a total solar eclipse in many parts of the world, the fourth such celestial spectacle in the 21st century. In India the eclipse was partial and was visible mainly in northern parts of the country for two hours. Chairman of the moderate Hurriyat Conference Mirwaiz Umar Farooq has called for the inclusion of China in the ongoing composite dialogue between India and Pakistan on Kashmir. 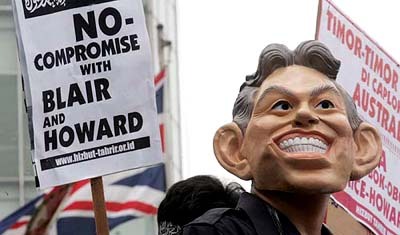 An Indonesian protester wears a mask of British Prime Minister Tony Blair during a rally outside the British Embassy in Jakarta on Wednesday. About 100 Indonesian Muslim demonstrators staged a protest ahead of a visit by Mr Blair to the world's most populous Islamic nation. Interim Prime Minister Ehud Olmert looked to begin building a coalition today after winning Israel's election on his plan to impose final borders with the Palestinians by uprooting many West Bank settlements. The Senate Judiciary Committee of the USA has voted to significantly increase the number of H-1B visas for highly skilled foreign workers as part of a controversial immigration bill that faces a tough fight in the Congress before it becomes law. Twelve persons were killed after a fire broke out in an illegally occupied building in downtown Johannesburg today, local media said. Authorities in south Thailand have detained 19 school teachers, from a prominent Islamic education centre, suspected of being involved in the separatist insurgency, which has claimed more than a thousand lives in the countrys Muslim-majority border region since January 2004. "This change in policies has sent uncertain signals to other countries, including North Korea and Iran, and may encourage technologically capable nations to choose the nuclear option. The proposed nuclear deal with India is just one more step in opening a pandora's box of nuclear proliferation," he said in an article in The Washington Post. He said there were no detectable efforts being made to seek confirmed reductions of almost 30,000 nuclear weapons worldwide, of which the USA possesses about 12,000, Russia 16,000, China 400, France 350, Israel 200, Britain 185, India and Pakistan 40 each. "A global holocaust is just as possible now, through mistakes or misjudgements, as it was during the depths of the Cold War," he said. Mr Carter said there was some fanfare in announcing that India plans to import eight nuclear reactors by 2012, and that US companies might win two of those reactor contracts, but stressed that it was a minuscule benefit compared with the potential costs. "India may be a special case, but reasonable restraints are necessary. The five original nuclear powers have all stopped producing fissile material for weapons, and India should make the same pledge to cap its stockpile of nuclear bomb ingredients," he said. The Democrat said the proposal for India would allow enough fissile material for as many as 50 weapons a year, "far exceeding what is believed to be its current capacity." "So far India has only rudimentary technology for uranium enrichment or plutonium reprocessing, and Congress should preclude the sale of such technology to India," he said. Another expert, Stephen Flynn of the Council on Foreign Relations, outlined numerous security gaps in global trade and shipping. Flynn, a retired Coast Guard commander, said the country was living on ‘‘ borrowed time’’ for avoiding a so-called dirty bomb that could contaminate a financial district or residential neighborhood and wreak havoc on the economy. They were among the witnesses before the Senate Permanent Subcommittee on Investigations one day after the release of a government report that said that four years after the attacks on New York, Washington and Pennsylvania, federal undercover investigators were able to enter the USA with enough radioactive material for two dirty bombs. The prevailing theory is that the rings, so dazzlingly reflected by the distant Sun, comprise the remnants of an icy moon that long ago was smashed open by an asteroid or a comet. But a collision of this kind normally gives rise to debris in a wide range of sizes, from big lumps a kilometre wide to pebbles a few centimetres across. Photographs and radar sensing by scout probes, though, have hitherto shown Saturn's ring particles to be remarkably small, between a few centimetres to a few metres across. The only big exceptions were a pair of kilometre- wide moons called Pan and Daphnis that lurk within the ring system. There seemed to be nothing in the intermediate size. Astronomers led by Matthew Tiscareno of Cornell University, New York, believe they have found some of the missing medium-sized rocks. Their evidence comes from data sent back by the orbiting US spacecraft Cassini, which show gaps, shaped rather like a propeller blade or an elongated teardrop, in some of the rings. Countries lying directly under the total eclipse were Brazil, Ghana, Togo, Benin, Nigeria, Niger, Chad, Libya, Egypt, Greece, Turkey, Georgia, Russia, Kazakhstan and Mongolia.The umbra tracked eastwards in a dizzying three-hour celestial ballet across Africa and the West Asia before expiring in Asia, covering a distance of about 14,500 km. Observers got a partial eclipse some 2,500 km either side of the path of totality, with about a fifth of the sun obscured in the UK, southern Sweden and the southern Gulf. ‘‘The APHC is preparing a roadmap of 2020 for the resolution of the Kashmir issue in which we will also recommend the inclusion of China as a party,’’ the Mirwaiz said at the final round of the series of discussions on Kashmir at the World Social Forum (WSF) being held at the KMC Sports Complex, here yesterday. At the workshop on Kashmir the moderate Hurriyat. chief told the WSF that besides India, Pakistan and Kashmiri leadership, China should also be considered as a party in resolving the Kashmir issue. The inclusion of China, he said, was necessary because ‘‘it occupies a large part of the Jammu and Kashmir and the forces of globalisation could not be ignored in this issue’’. He said the Kashmiri leadership was not satisfied with the dialogue process between the two nuclear-armed neighbours. Interim Prime Minister Ehud Olmert looked to begin building a coalition today after winning Israel's election on his plan to impose final borders with the Palestinians by uprooting many West Bank settlements. Appealing to Palestinian President Mahmoud Abbas, Mr Olmert said in a post-election speech that Israel was ready to live alongside the Palestinians in peace after decades of conflict. But in the absence of peace talks now remote with the Islamist militant group Hamas about to take office Olmert has vowed to set Israel's frontier by 2010 by removing isolated West Bank settlements while expanding bigger blocs there. This measure to double the number of temporary visas to H-1B skilled-workers to 115,000 — with an option of raising the cap 20 per cent more each year, was buried in the Senate’s giant 300-page Immigration Bill, that got approved 12-6 yesterday. The bill, once adopted by the Senate and the Congress, would open the country’s doors to highly skilled immigrants for science, mathematics, technology and engineering jobs from India, China and other nations. The teachers were arrested on their return from an educational meeting in a neighbouring Thai province under an emergency executive order in force in the three troubled southern Thai provinces of Yala, Narathiwat and Pattani. They teach in a school said to be established by the most wanted southern Thai separatist leader.